WASHINGTON – There are many memorials in the nation’s capital that honor veterans of specific wars or particular branches of the military, but the newest addition honors veterans from all branches and all wars who returned with a disability. The American Veterans Disabled for Life Memorial in the shadow of the Capitol features a reflecting pool, bronze statues and more features honoring their service and acknowledging their sacrifices. For James Pierce the memorial is special. Pierce lost a leg while serving in Afghanistan, and is now stationed at the memorial as a ranger. 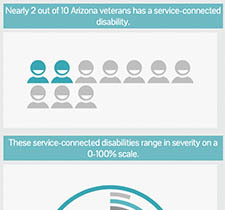 There are nearly 90,000 disabled veterans in Arizona, more than 34,000 of whom have a disability rating of 50 percent or higher as a result of their service.